1. Start by entering details of your item in the search box, then click Search. 2. Choose the item you want from the Results List. Click on its Name or its Cover Image to see the detailed record. 3. On the left hand side of the Detailed Record screen, there are two red buttons directly below the Cover Image of the book. Click on the one on the Left, called “Add an Alert”. 4. This brings up a box where you can specify your preferred price. The box automatically shows the current best price. You can also delete that value and enter a different lower price. Then enter your email address, and click “Add”. 5. That’s done! Booko checks prices daily, and when the price of your item drops below your preferred price, you will receive an email alerting you to the new lowest price, with links straight to the relevant Seller. If you are creating alerts for multiple items, then you will find it useful to create a Booko account. Once Logged In, you can view a list of all of your alerts, and update them as necessary. You can also include second-hand books in your price watch. 1. 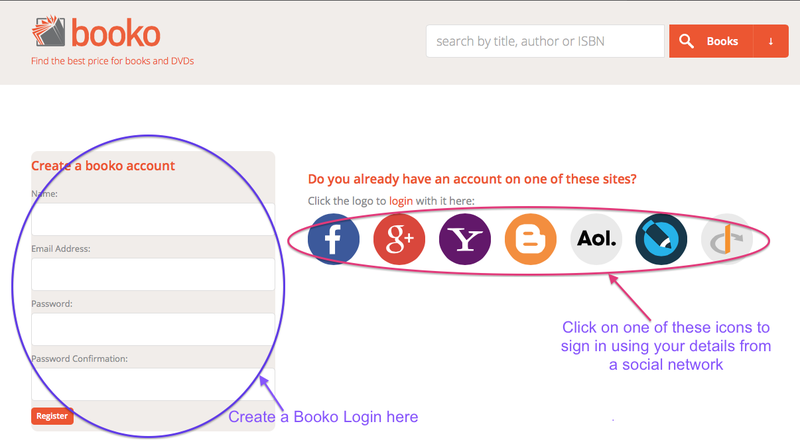 To create a new Booko Account, scroll down to the bottom of the Booko homepage, and click on the red “Sign Up” button. 2. On the Create an Account page, you can either use the form on the left hand side to create a new Booko ID, or you can click on one of the icons on the right, to connect using your account details of your favourite social network. When prompted, allow Booko to share the login details of your chosen social network, and Booko will do the rest. 4. Once you are a registered user, simply Sign In to your Booko account before you create an Alert. 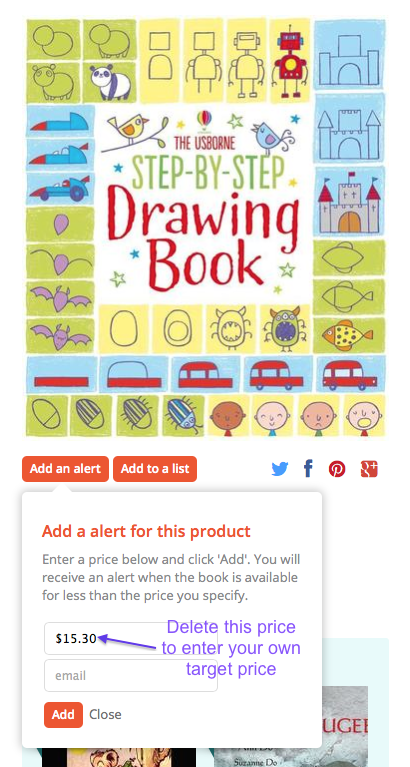 The Sign In button is located at the top left corner of the Booko page. When you have signed in, you will not need to supply an email address each time you create an alert. 5. To view the full list of your Alerts, click on “My Alerts” at the top right corner of the Booko page. This will take you to the Booko Sign In page if you are not signed in at the time. 6. The list of Active Alerts shows the current price and the target price for each item. 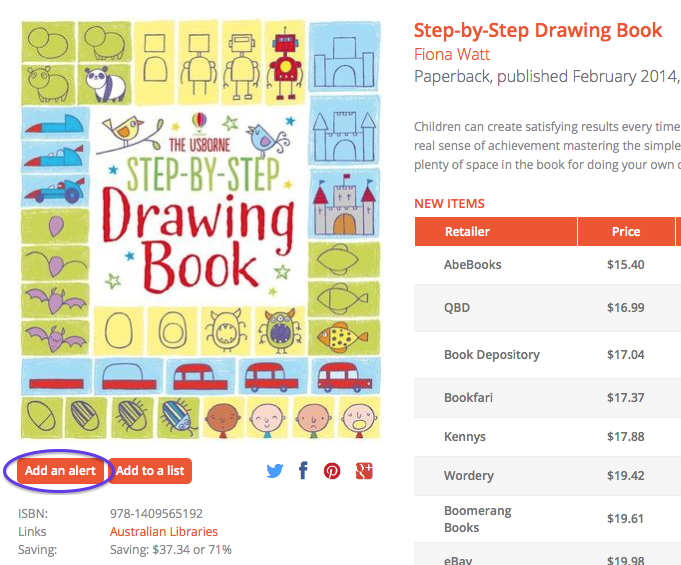 You can change the target prices, or delete alerts here. Check the box for “Include Used” if you want to track the prices of used copies as well as new ones. Don’t forget to click “Save” each time you made any changes!